Torque Solution Solid Billet Rear Shifter Bushing for Honda/Acura w/ D or B-Series engines. 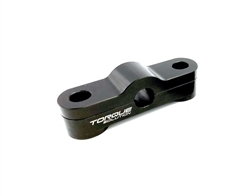 Made from CNC'd 6061 billet aluminum and then anodized black to ensure they look as good as they perform. These are perfect for replacing the flimsy OEM rubber bushings. Installing our billet bushings will improve shifting precision and response ensuring you are able to catch every gear just right.